This step is about combining your goods. In reality, you may not be able to start literally combining your goods at this early stage. The point is to combine them on paper so you’re working with ONE list of what you need to acquire, and then to combine them physically as you are able to. This step is to keep you from buying (or registering for) things you already own. 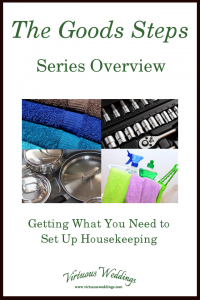 It will also help you understand what you own and how well they suit your purposes. So, if you’re going to set up housekeeping you need some stuff. “The Goods Steps” are just a step-by-step plan to manage that process. 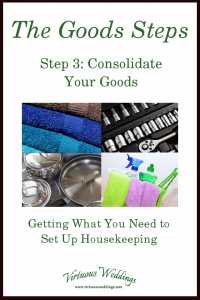 “The Goods Steps” are a step-by-step plan to manage the process of getting the goods you need to set up housekeeping.